Save big on printer supplies with 123inkjets coupons, promotion codes, and discount deals. New ink and toner cartridges can be very expensive, but with 123Inkjet coupon codes you can get extra savings or free shipping on printer cartridges that are already cheap to start with. Because we techies spend so much time at our computers, we can run through ink like water. Unfortunately, printer ink cartridges can make a dent in our budgets. It’s therefore important to find deep discounts on printer ink supplies. At www.123inkjets.com, you’ll save up to 75% on inkjet cartridges, ink refills, laser toner cartridges, toner refills, and other printing supplies while receiving a 100% satisfaction guarantee. 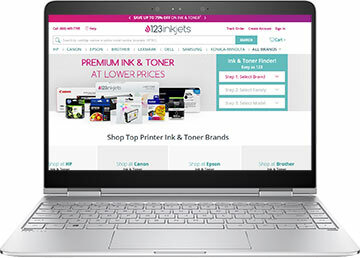 Founded in 1999, 123inkets.com is a top online supplier of discounted toner and ink cartridges and was named a BizRate Circle of Excellence Winner in 2010. They retail ink for nearly every brand of printer imaginable, from Apple, Brother, Cannon, and Dell to Xerox, Toshiba, Sharp, and Samsung. Get Epson ink cartridges, HP laser toner cartridges, Pitney Bowes ink cartridges, or Lexmark toner. Save on ink and toner for IBM, Kodak, Konica-Minolta, Kyocera-Mita, NEC, Okidata, Ricoh, and Panasonic printers as well. Find the exact ink or toner cartridge you need when you shop by printer and model. 123inkjets makes saving on ink quick and easy. They have a live customer service team that can assist you if you encounter any difficulty finding the precise printer ink product you need. You can like 123 inkjets on Facebook or follow them on twitter to be kept appraised of future price reductions and great deals on ink and toner. Check your order status conveniently online. If you’re looking for high quality inkjet and toner cartridges at the lowest possible prices, you’d do well to start your search at this discount retailer.